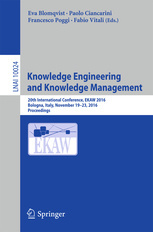 This book constitutes the refereed proceedings of the 20th InternationalConference on Knowledge Engineering and Knowledge Management, EKAW 2016,held in Bologna, Italy, in November 2016. The 51 full papers presented were carefully reviewed and selected from 171 submissions. The papers cover all aspects of eliciting, acquiring, modeling, and managing knowledge, the construction of knowledge-intensive systems and services for the Semantic Web, knowledge management, e-business, natural language processing,intelligent information integration, personal digital assistance systems, and a variety of other related topics. A special focus was on "evolving knowledge", i.e., the impact of space and time on knowledge representation, concerning all aspects of the management and acquisition of knowledge representation of evolving, contextual, and local models.